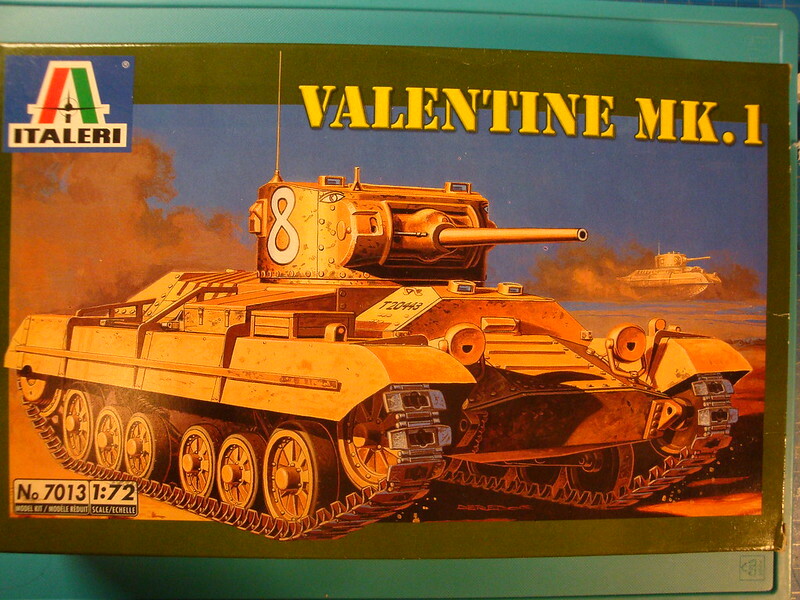 The Valentine tank was the direct successor of the Matilda. 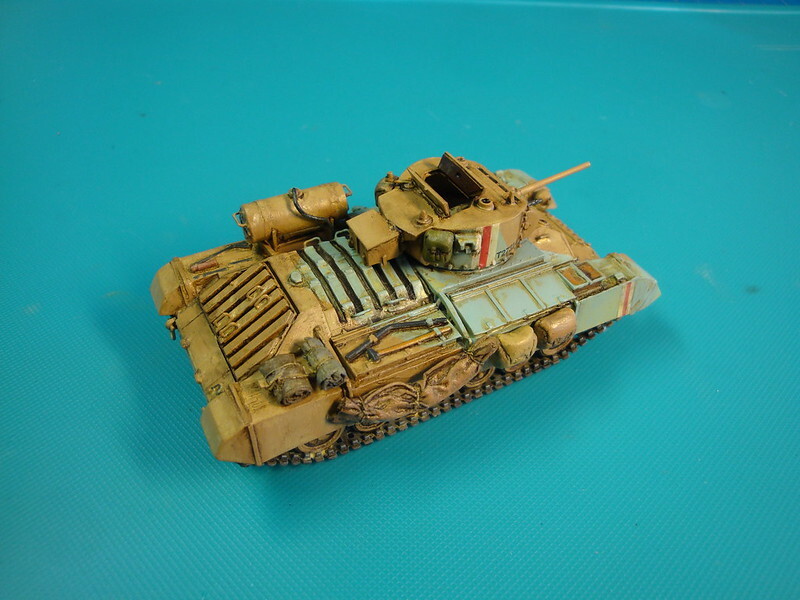 A bit faster and with a bit thinner armour, it was a more balanced design than the Matilda. A weak point however was the 2-pounder gun, that was too light to fight the second generation of German tanks, and for which no high explosive shell was available to fight infantry and anti-tank guns. 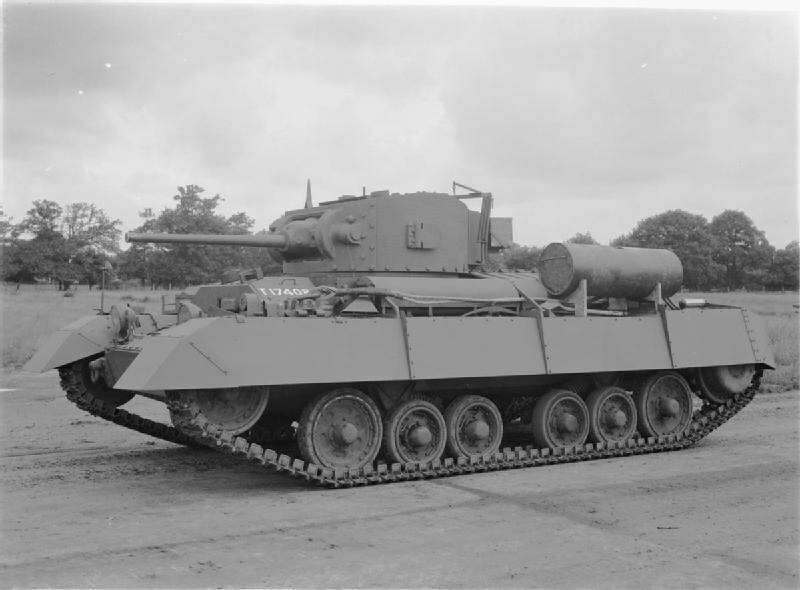 The Valentine was developed by Vickers Armstrong, based on the proven technology of lighter and faster cruiser tanks. Thus the new model could be developed much faster. 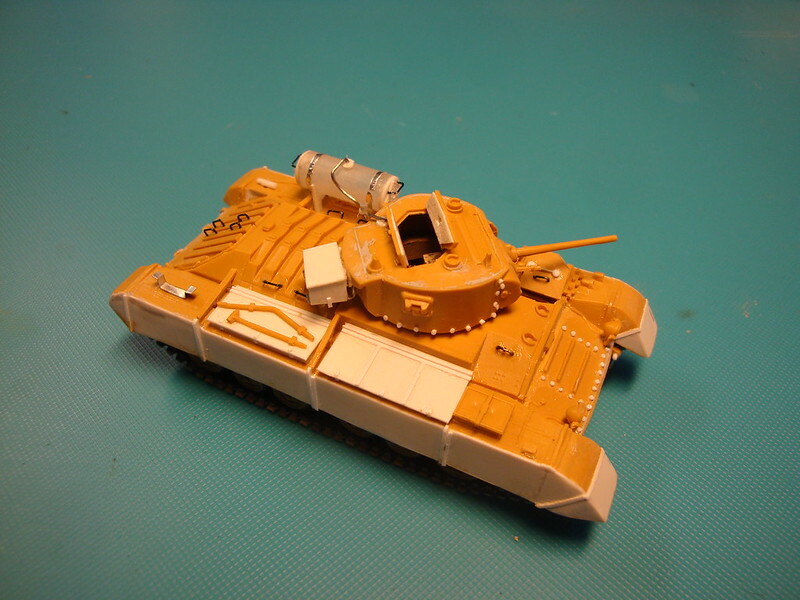 The small size of the Valentine limited the crew to three, which was insufficient for a battle tank. 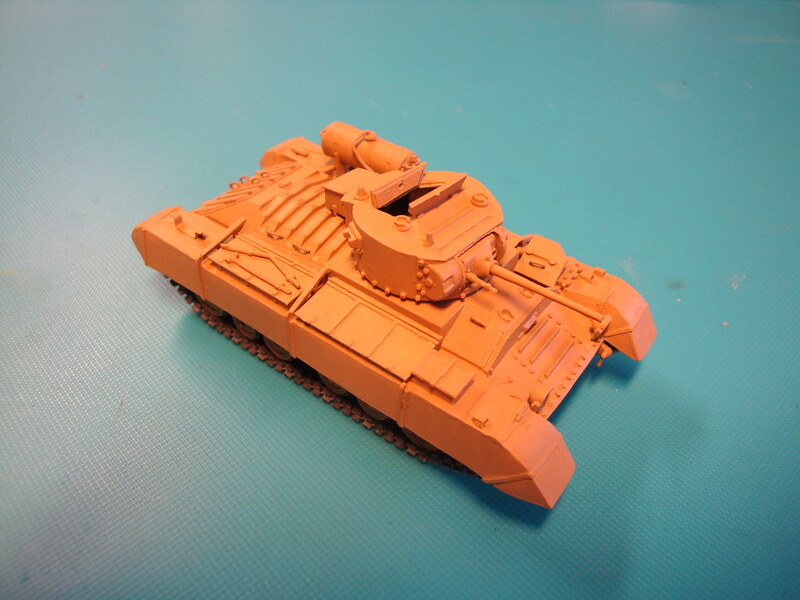 Improved models with a heavier gun and a three man turret also were not very succesful. 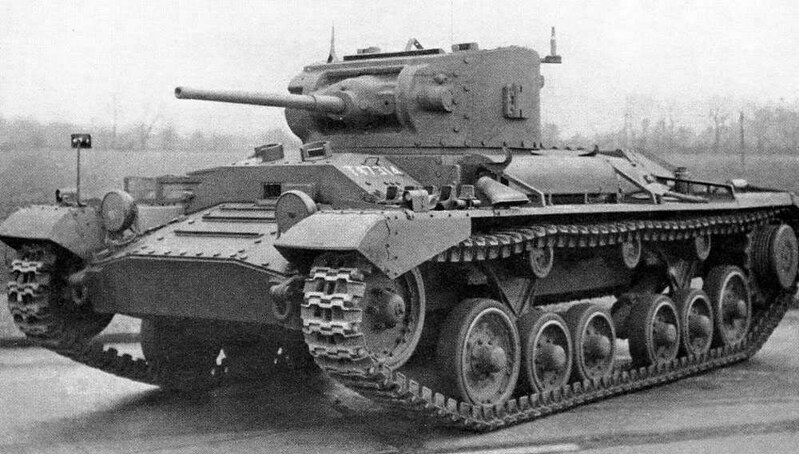 From 1942 on the Valentine was replaced in front-line service by the better armed, better armoured and much roomier Churchill tank. Valentine equipped for desert warfare. Notwithstanding her grave limitations, the Valentine became one of the important British tank designs of the war. 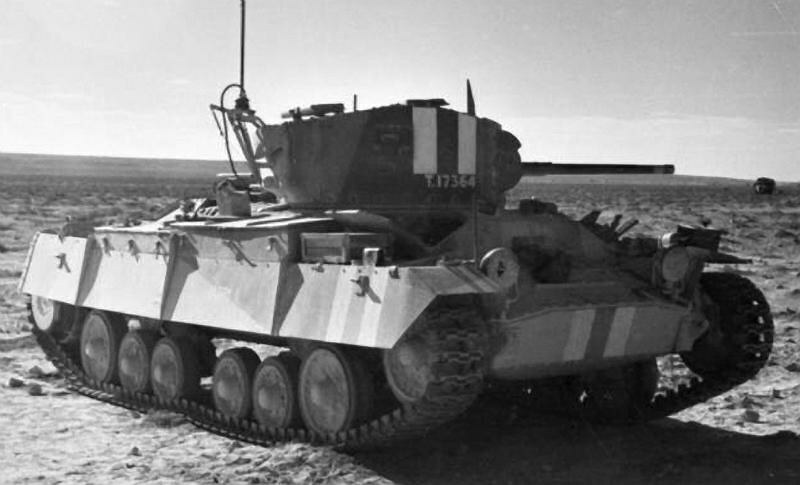 From the second half of 1941 it was the most numerous tank of the Eight Army in North Africa. Almost 4.000 Valentines were exported to the Soviet Union. In South East Asia the Valentine was used by the New Zealand army against the Japanese. In Britain the Valentine had an important role in training tank crews. 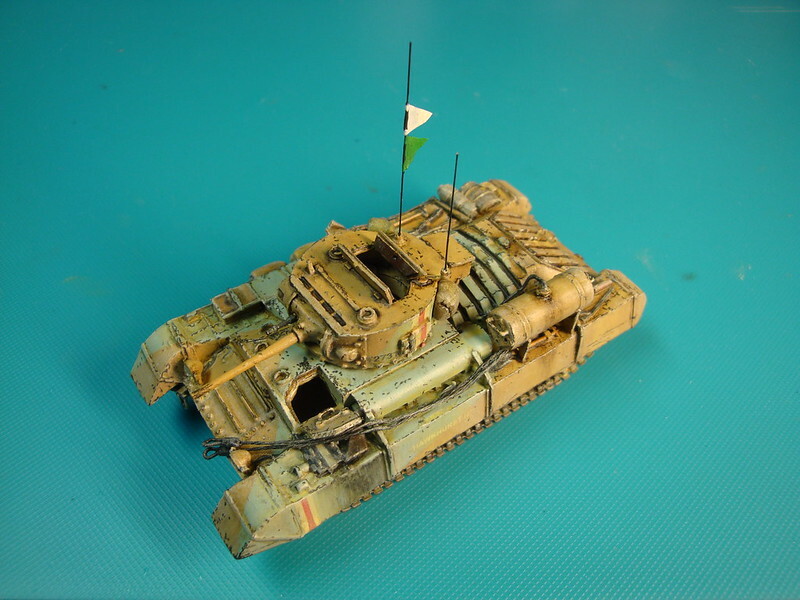 With more than 8.000 produced it was the most produced British tank from WW2. 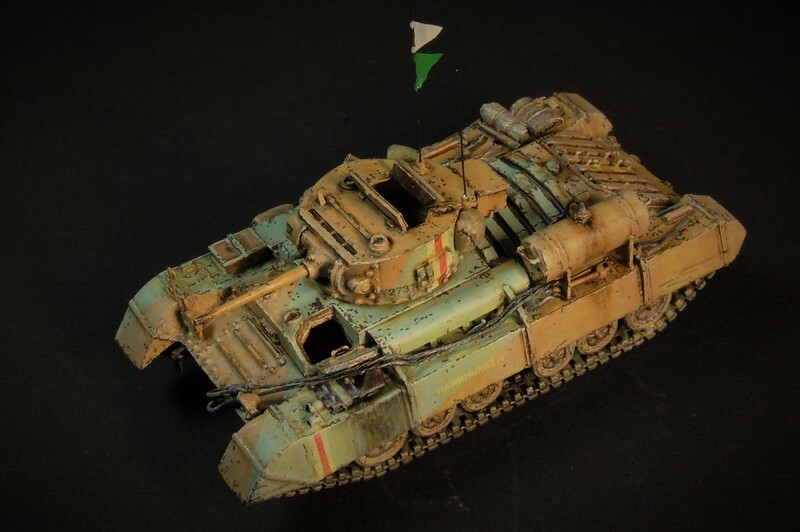 And although obsolete as a battle tank from the beginning of its career, its reliable chassis proved useful as a base for many special vehicles, like self-propelled guns (Bishop), tank destroyers (Archer), bridgelayers, mine-clearing and flamethrower tanks. 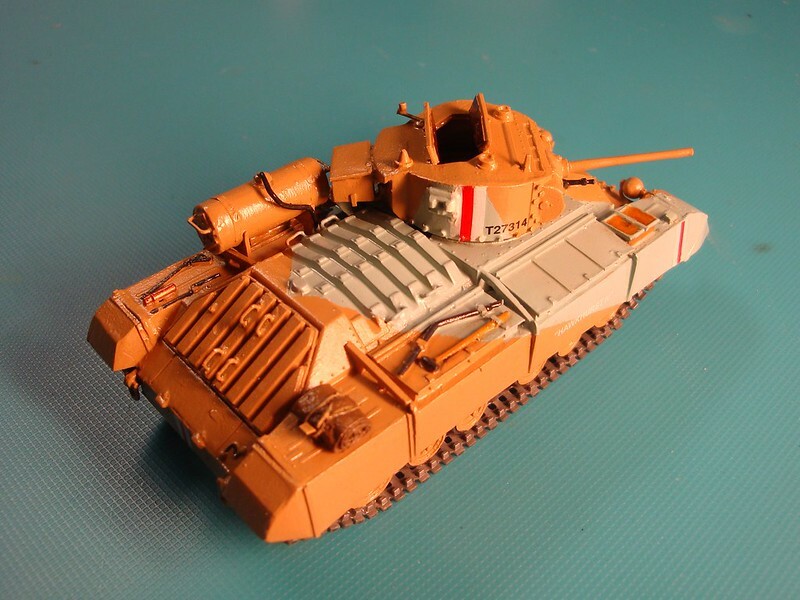 This Italeri kit from 2003 is a re-box of a much older Esci model from 1976. 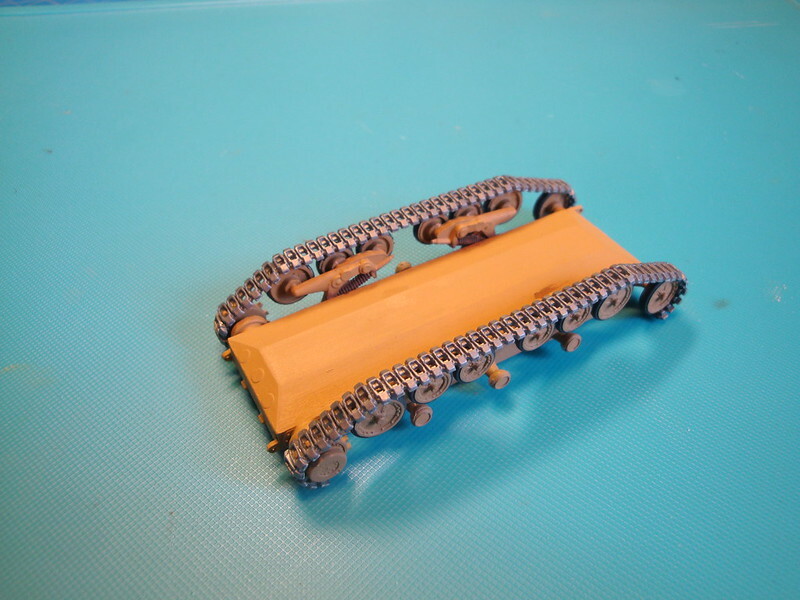 In it's later issues Esci already replaced the rubber band tracks for much better link&length tracks. 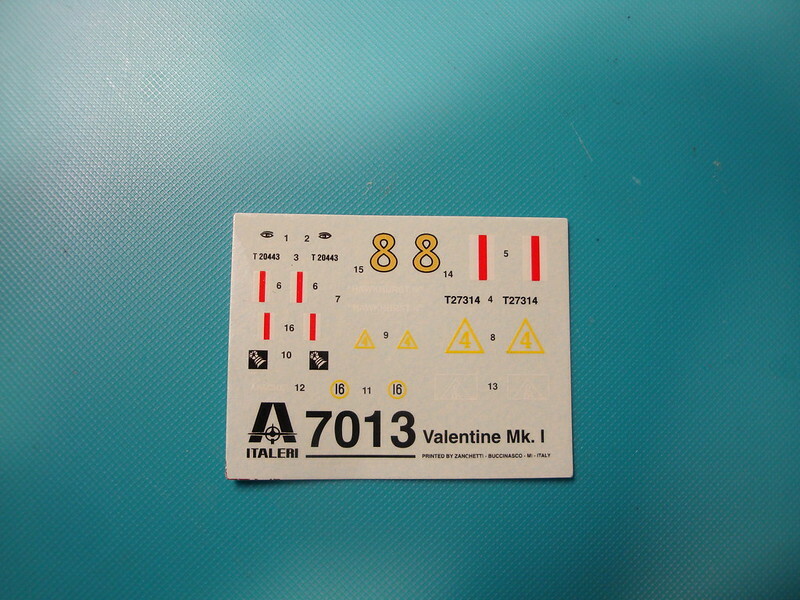 All Italeri added was a fine new decal sheet for four different versions. This leads to a nice kit. The backside with the other three options, incuding a Soviet Lend-Lease version. 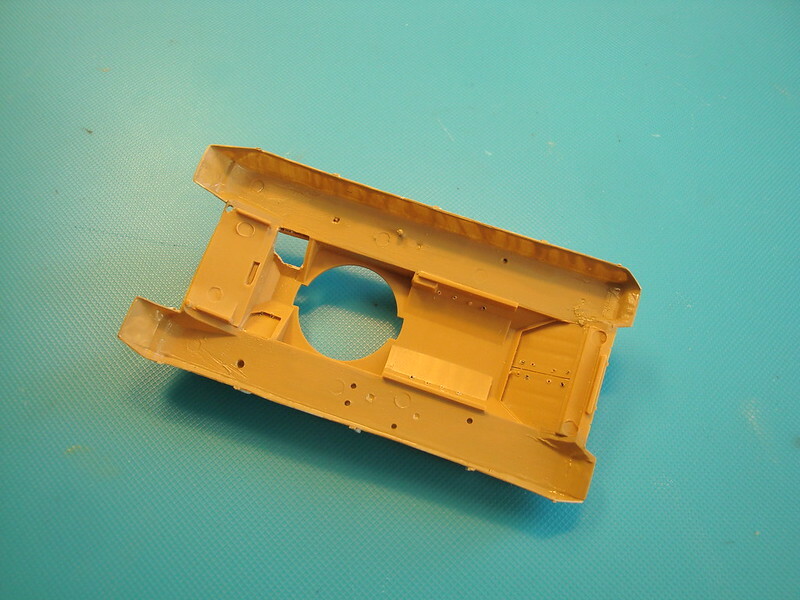 The sprue containing all parts for the hull. 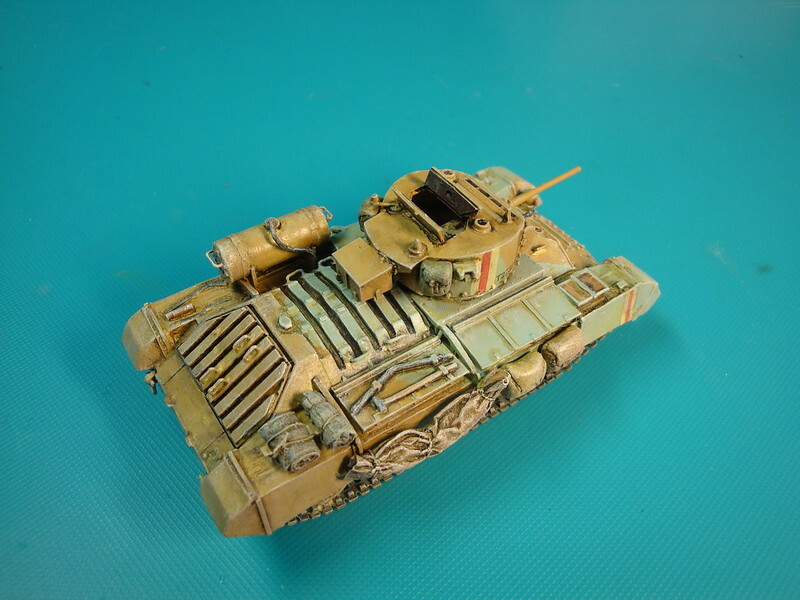 Very practical as Esci/Italeri also issues another kit based on this hull: the Bishop self-propelled gun. 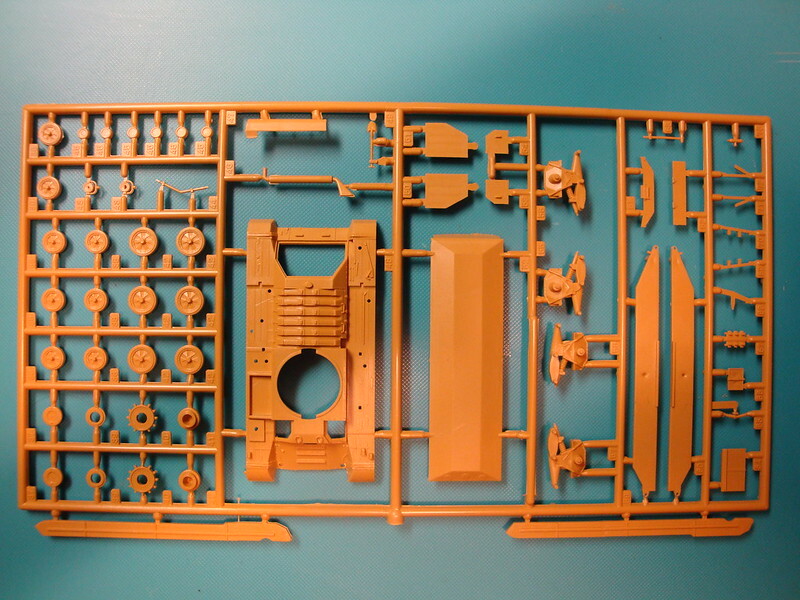 The sprue containing all parts for the turret, including a figure. Next to it the link&length tracks, which look very good. And a good looking decal sheet with four options. 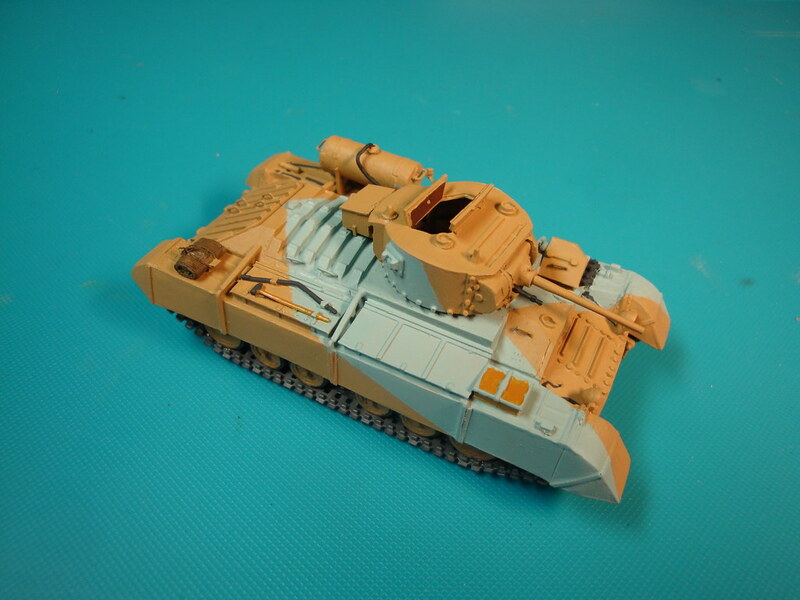 On this picture you see a Valentine Mk.II in desert livery. This includes huge dust shields around the tracks and a long range fuel tank. 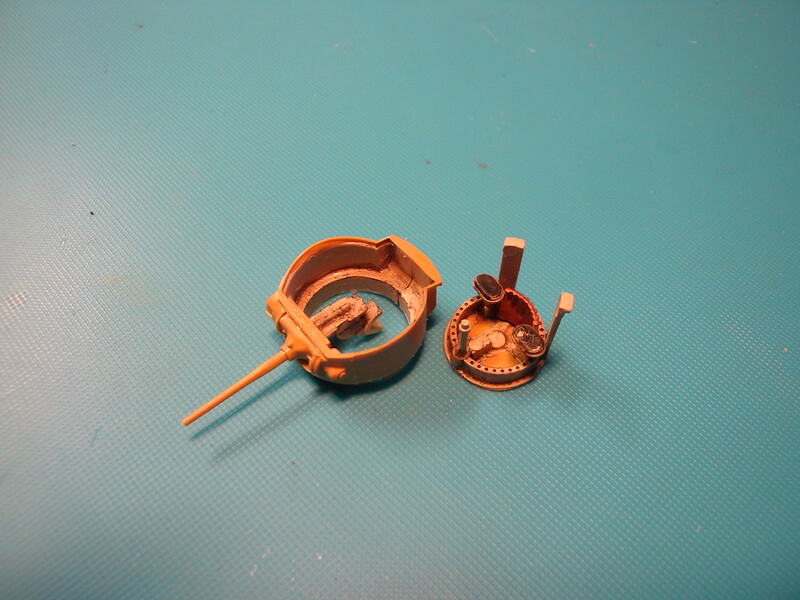 I will try to scratchbuilt these, and add some more detail. I am struggling a bit with the build order. 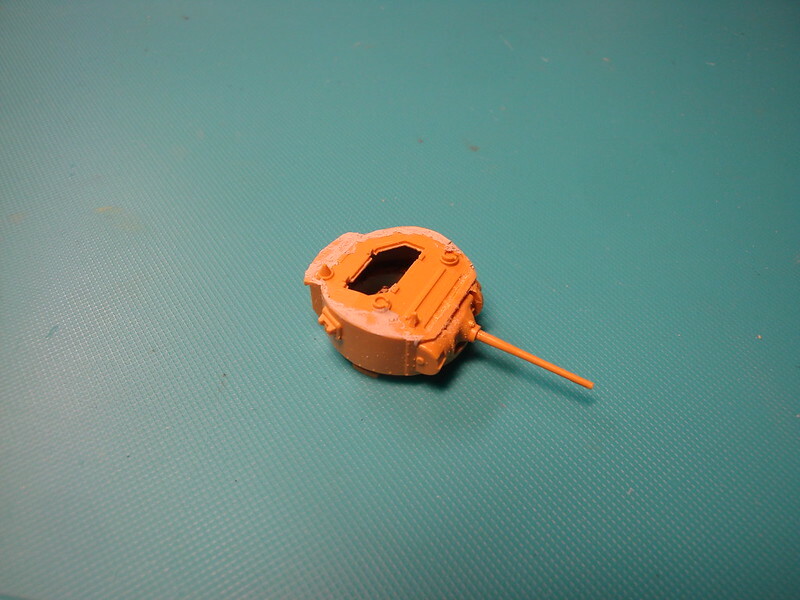 Normally I start with the hull, and install the wheels and tracks only after painting and weathering. 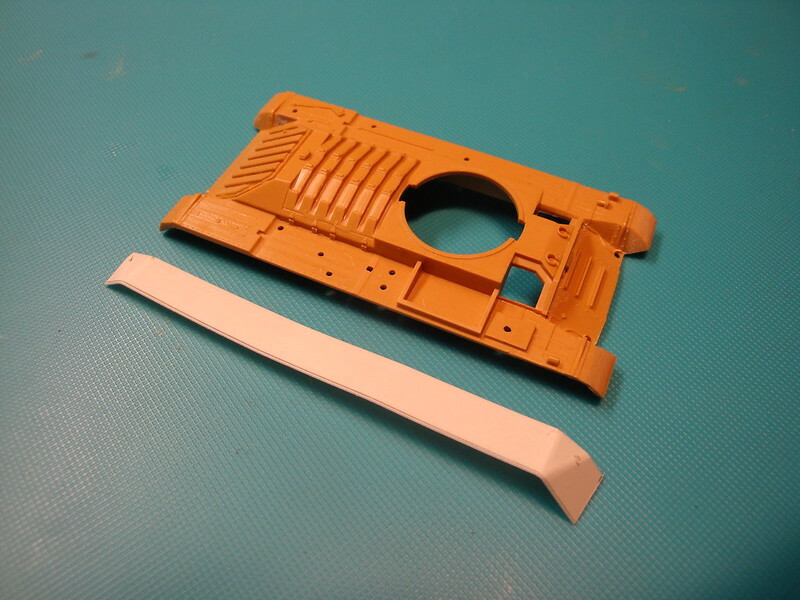 But as I have to scratbuild the large dustshields around the wheels and tracks, I decided to start with these parts this time. Now on with the tracks. 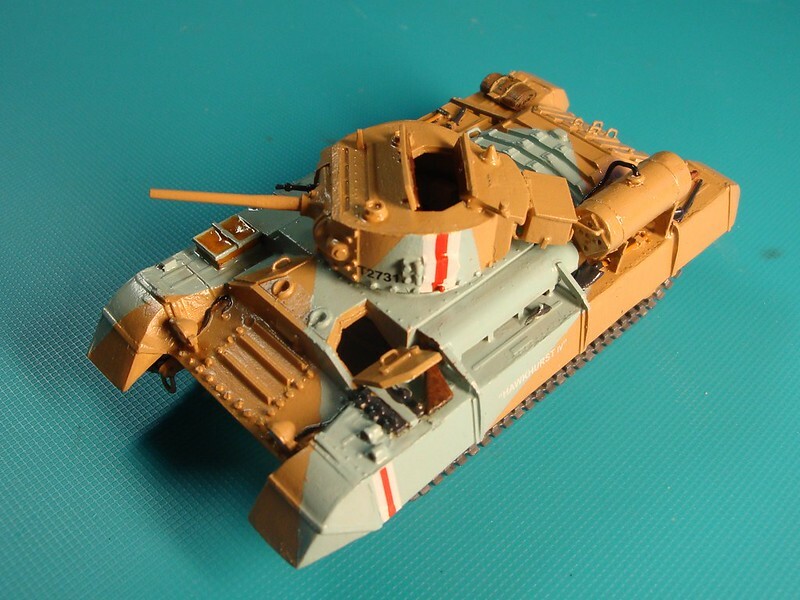 This Italeri issue of this kit has very nice link&length tracks. 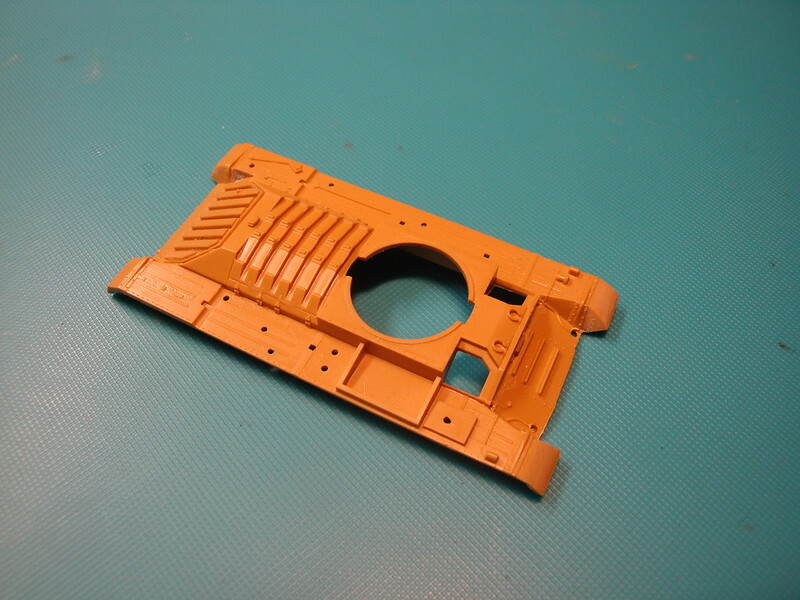 The tracks have nice detail, and a very good and easy fit. What a relief! 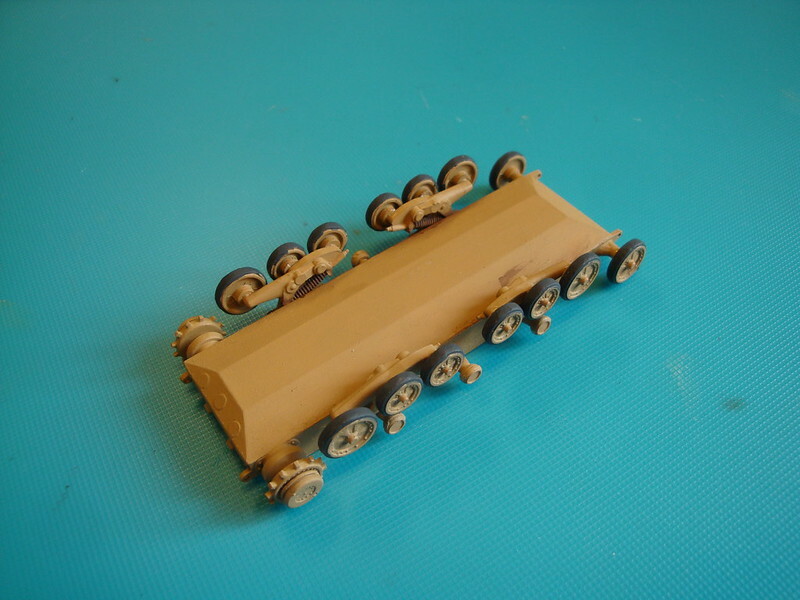 In my experience the tracks are most of the times the most difficult part of tank modelling. Not with this kit. I left the upper part of the tracks off. They will disappear completely under the dustboards, and are a nice asset for the spare-box. Now to continue with the greatest challenge of this kit: the dust boards. This is the upper hull as supplied. Quite good in detail. 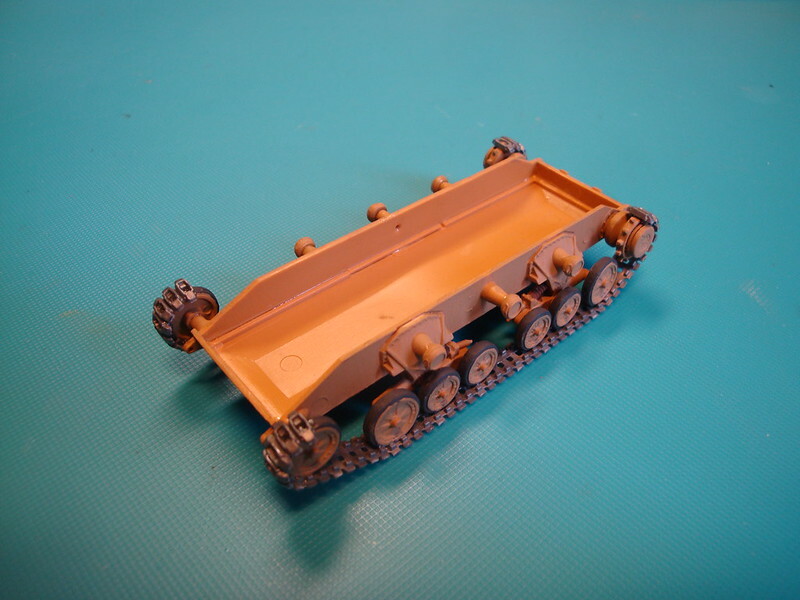 But I do not like the kit supplied mudguards, so I will change them and add some other detail based on pictures of the Mk.II desert version. I started with the mudguards, or better, dust boards. 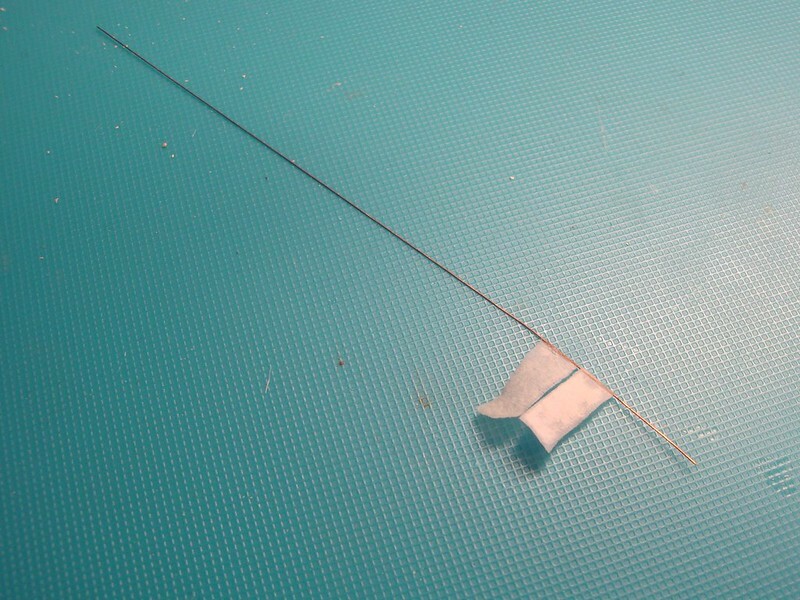 I used 0,3mm evergreen which I bent into shape. Glued to both sides. Now it has to be cut, filed and sanded to fit exactly. Boxed in the front of the dust boards with pieces of evergreen. The dustboards finished and fully detailed. 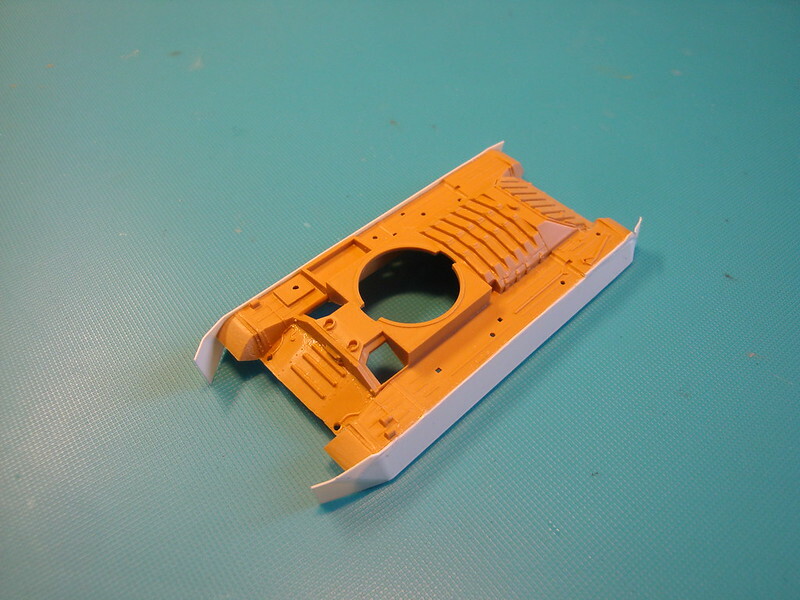 Furthermore some extra detail on the hull: rearview mirror, stowage boxes, handrails, etc. And on the back of the vehicle the conspicious long range fuel tank, with filler cap and fuel hose. Next step was to paint the inside of the dust boards, as this place cannot be reached anymore later in the build. 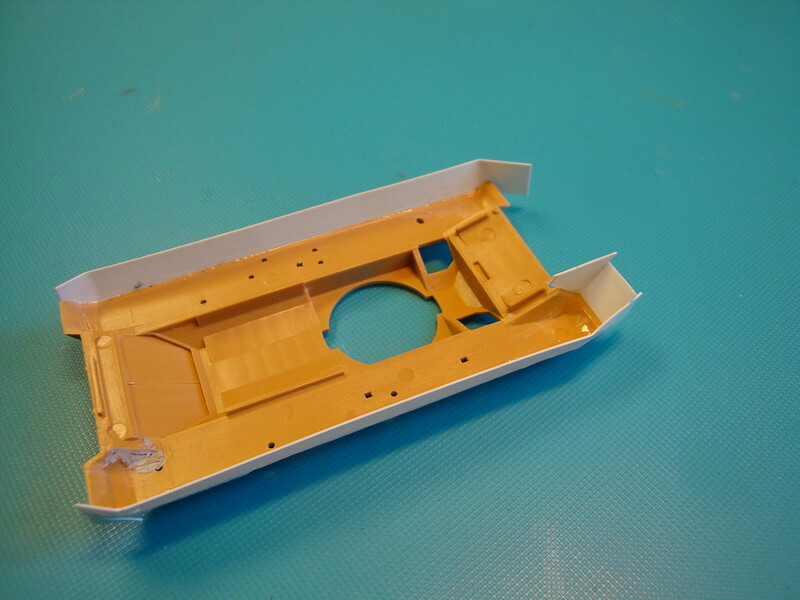 After that I glued to upper hull to the lower hull, filled and sanded some seams and added the last details: towing eyes, headlights and giant rivets. Nice to all the additions, that you drill the small lamps out too. Really splendid work on this W. I. P.
It would worry and bug me no end if i knew the tracks were missing from the top. That is if i was doing this topic,which i ain`t. That is how i am. They would be unseen true but there all the same. A few more pennies and a little extra work and they could easily be put into place. Beano Boy wrote: It would worry and bug me no end if i knew the tracks were missing from the top. Ha, yes I can imagine. After some years of modelling I came to the conclusion that for me it makes no sense to model things no one will ever see (Although I still do it now and then). 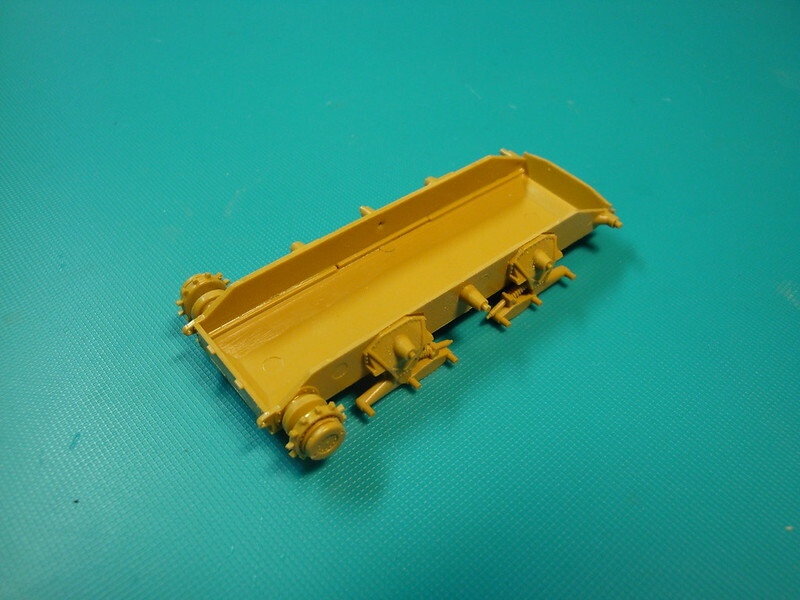 And second, a well filled sparebox is a fantastic asset for a modeller. So that is why I do not hesitate to make such decisions. But I can understand that you would make another choice. 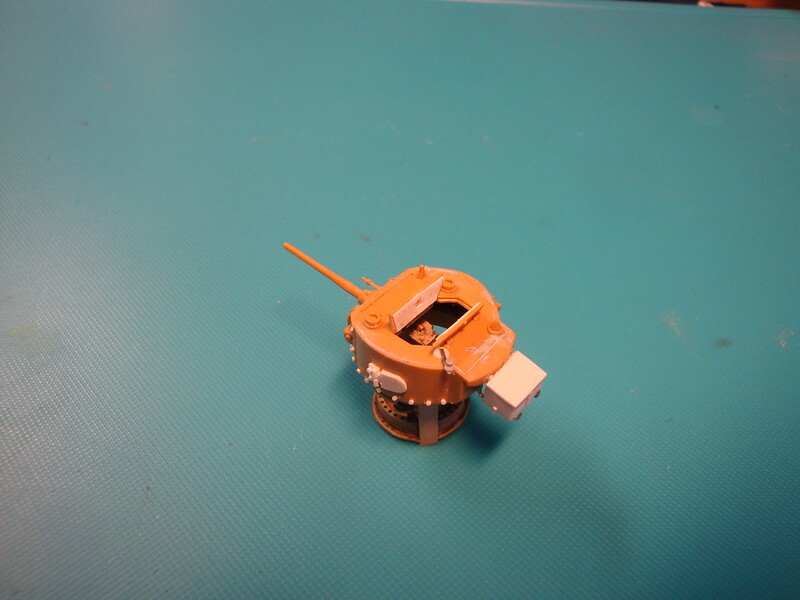 The next step is building the Valentine's turret. Very nice! 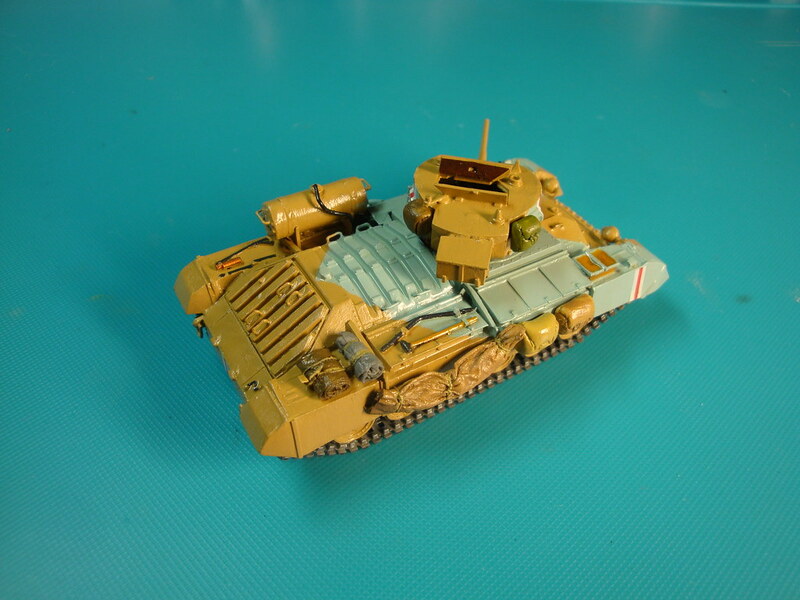 This kit contains a real turret floor, with two seats, a bit of ammo and a gun breach. Typical nice Esci details. You hardly encounter that in this scale, let alone in such old kits. 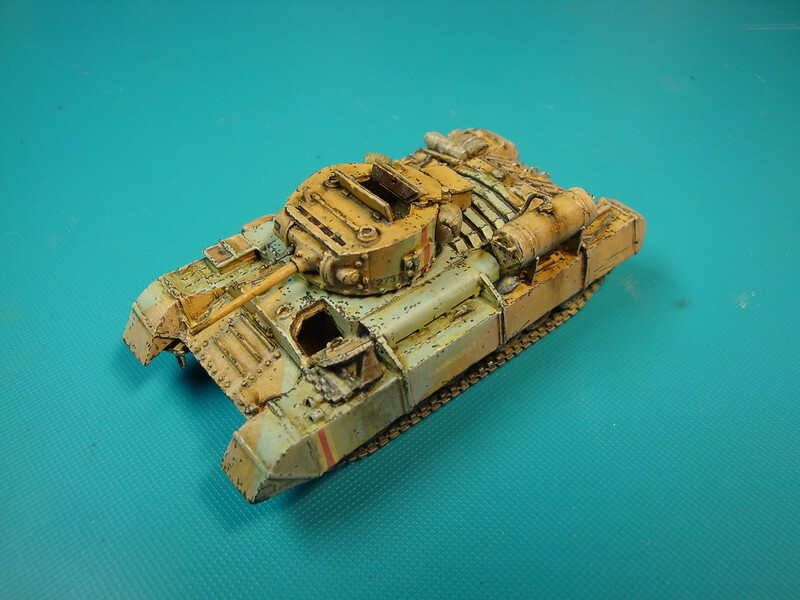 .....and some weathering, while in the end little can be seen of it. 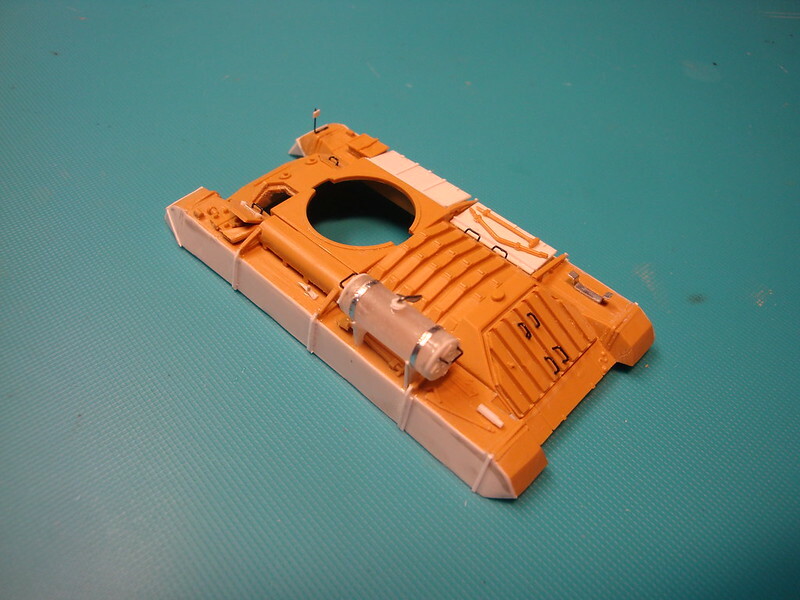 That's why I refrained from adding additional detail to the turret interior. 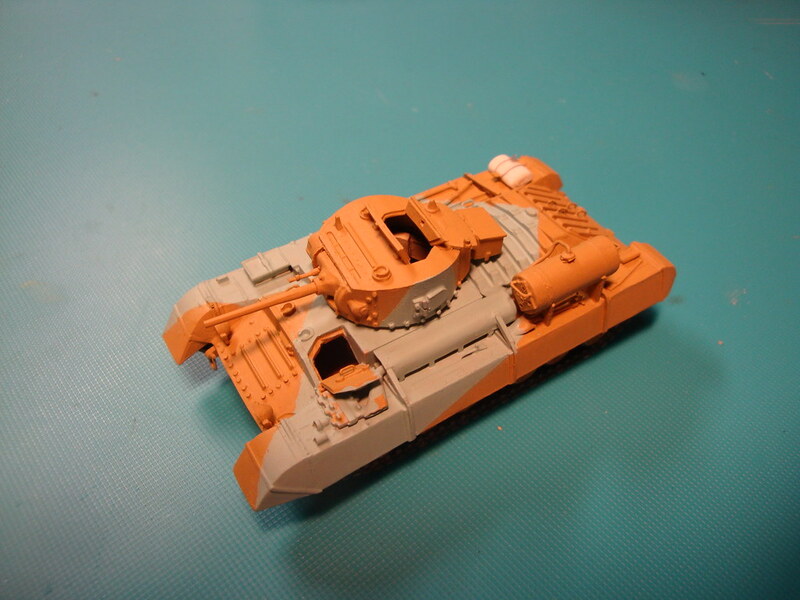 There was a serious gap between the turret roof and the turret walls that needed some filler. 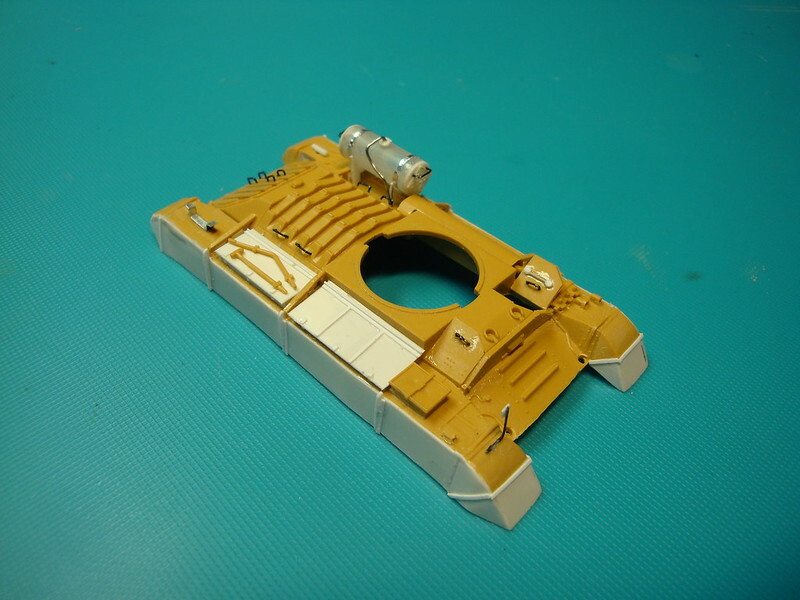 And finally I added some extra detail to the turret exterior: A hatch to the turret side, an extra stowage box, a second antenna mount, and some bold rivets. The rivets are present on the kit, but they were underscale to my taste. These are too big in fact, but I think they will have a nice effect. From another perspective. 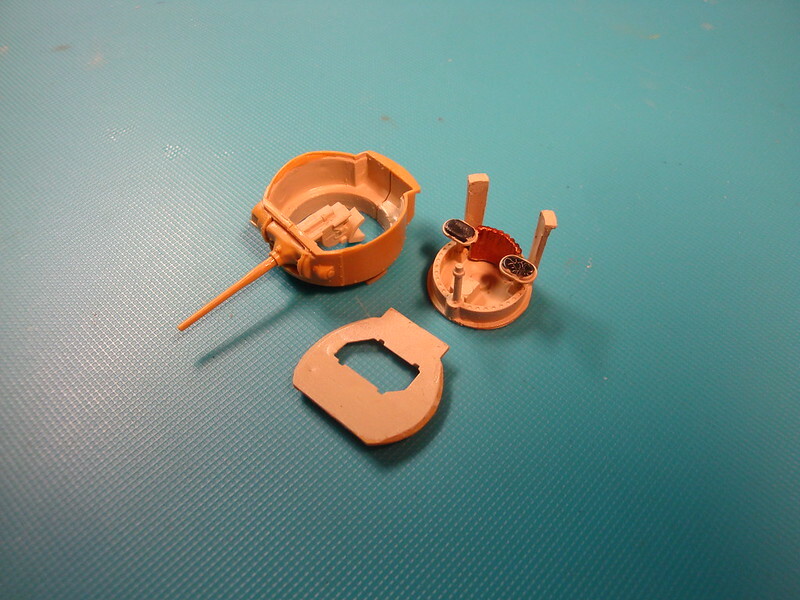 The roof hatches got some interior detail too. Quite nice with the turret floor. The Valentine received its layers of paint. First the whole tank covered in 'light stone' (Humbrol 93). Then a variety on the Caunter scheme, using light blue. 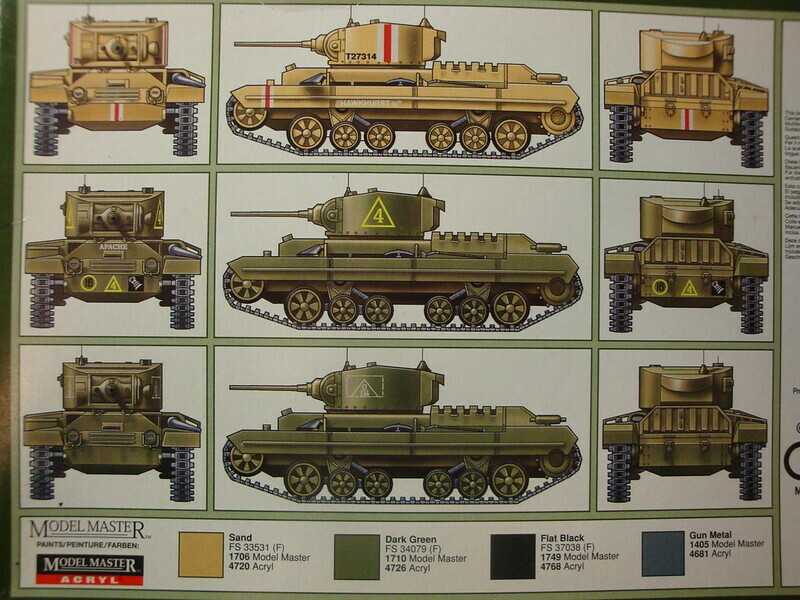 This picture is from tanks encyclopedia. Realistic or not, I like this scheme. After that I painted all details, like tools, exhaust, etc. First I covered the paintwork with two layers of gloss varnish. Then I applied the decals. 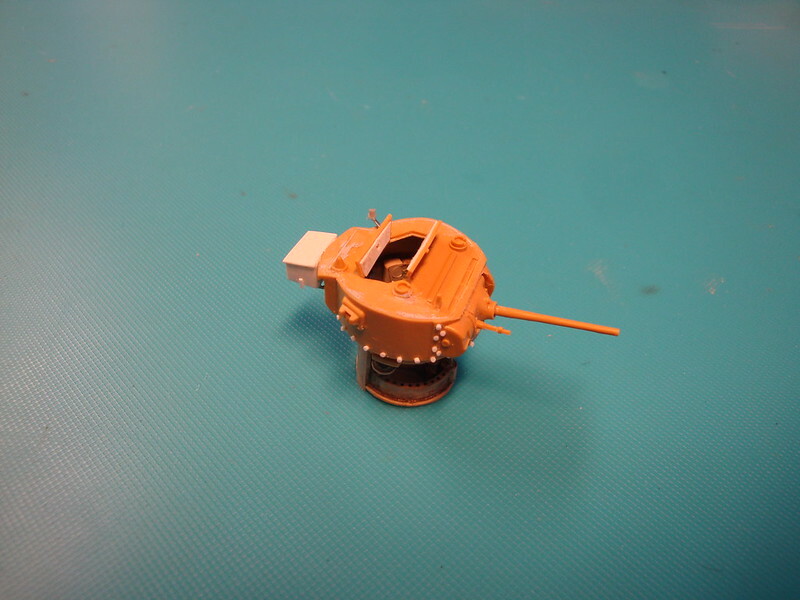 The decal on the turret appears to be askew, but that's optical deforming due to the turret side hatch. 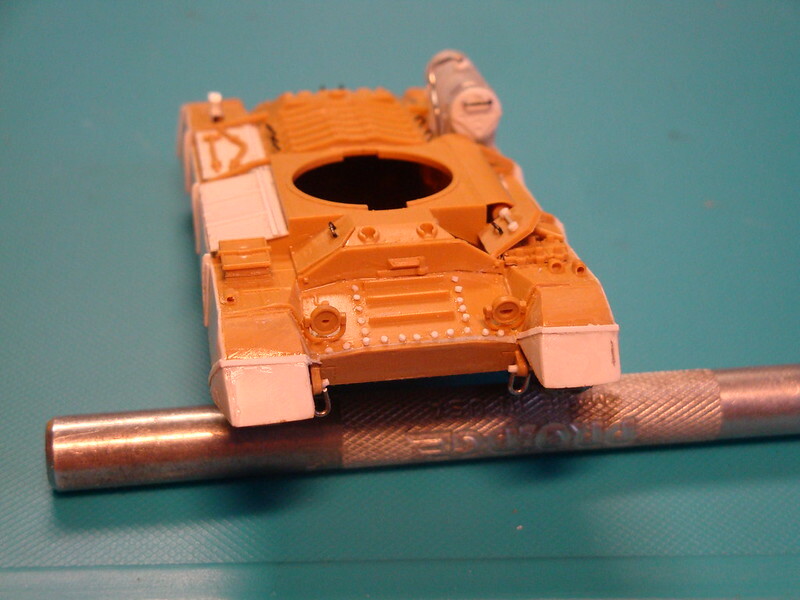 I had to lengthen the white-red-white markings on the turret and dustboards with paint. Because of my scratchbuilt additions the decals became too short. But it looks fine in the end. And now for some stowage. I was doubting a bit about the order of the building sequence. 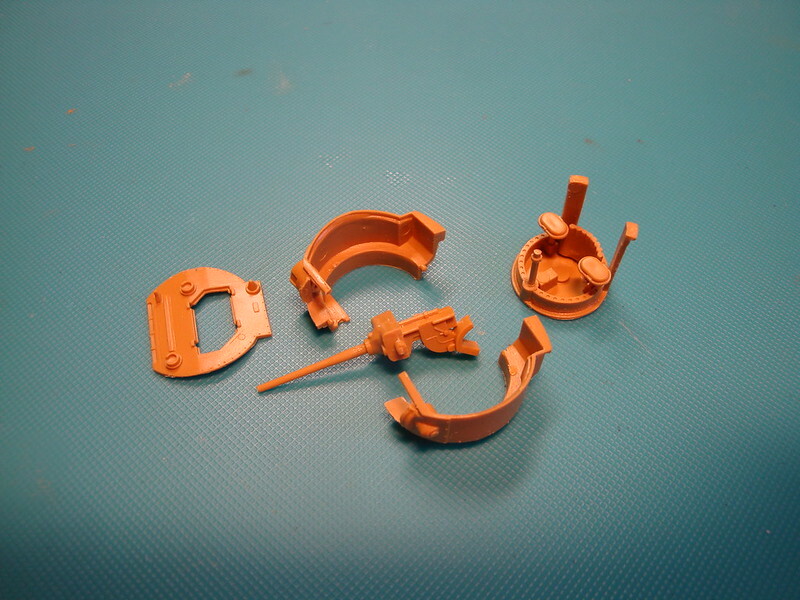 I decided to continue with the stowage first, so it can be included in the weathering process. 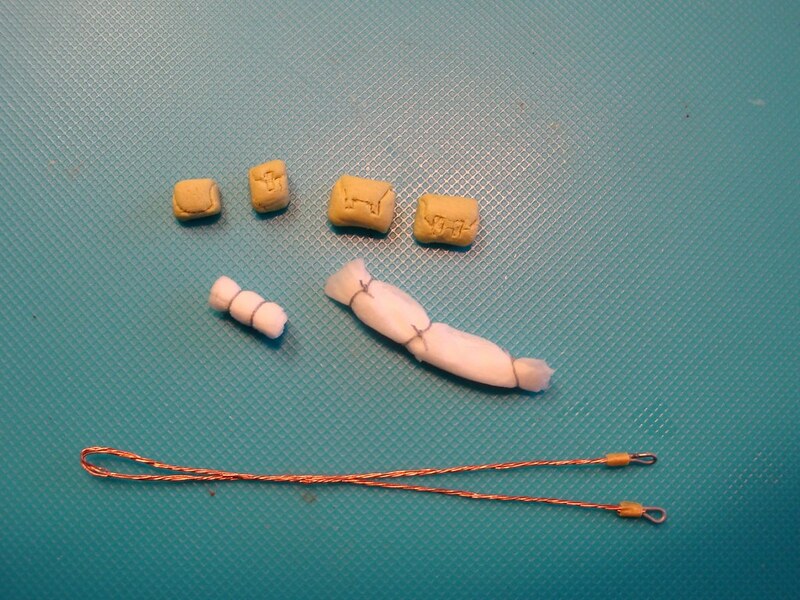 Four haversacks made of milliput, a blanketroll and a big tarp made of paper tissue, and a tow cable made of coper wire and iron wire. All painted in different colours. 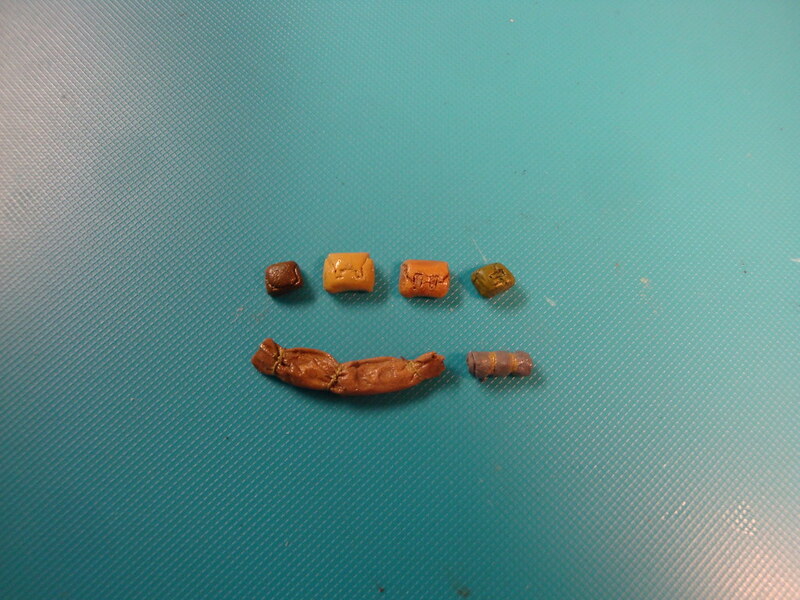 The weathering will bring the colours closer together but will still leave some nuances in colour. At least, that is the plan. The stowage glued to the Valentine. Two small haversacks on the turret, the other haversacks, blankets and tarps attached to the right side of the vehicle. I thought that logical as on the right side are the exhaust and the fuel tank, which would foul your blanket and haversack, I would say. 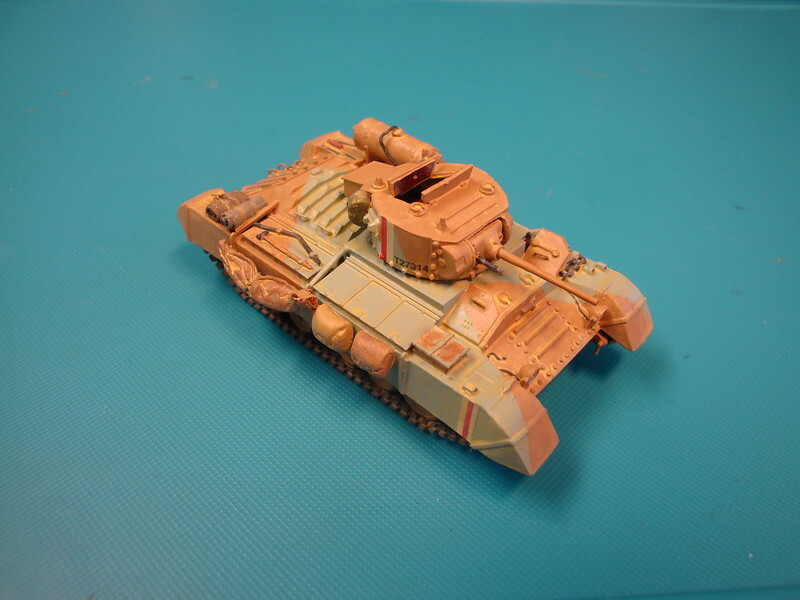 And now ready for weathering. First I covered the whole Valentine in a thick layer of a diluted oil paint mix in a light sandy colour: lot's of white and a bit of yellow ochre. The idea is to create a dusty look. After that I did a pointwash with dark brown oil paint, to increase visual depth. Then I drybrushed the whole model with a very light sand color to fade the colours, Next I drybrushed all extremities with white enamel to create highlights. Next step was to chip the model, using a soft graphite pencil. In my opinion I overdid it a bit. 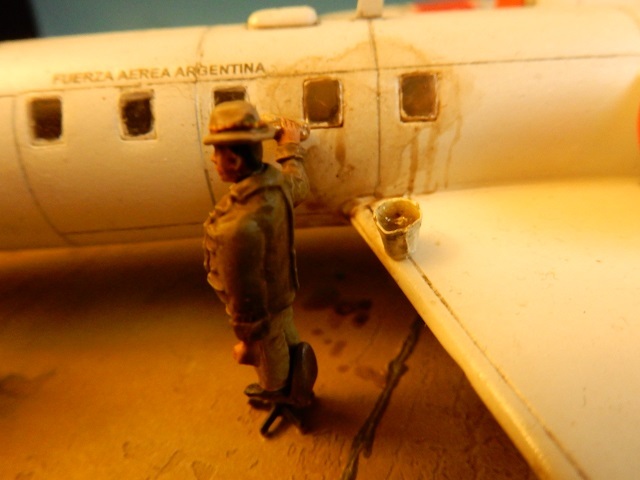 Exhaust and fuel stains were made using black and brown oilpaint that was modelled and faded with a dry brush. 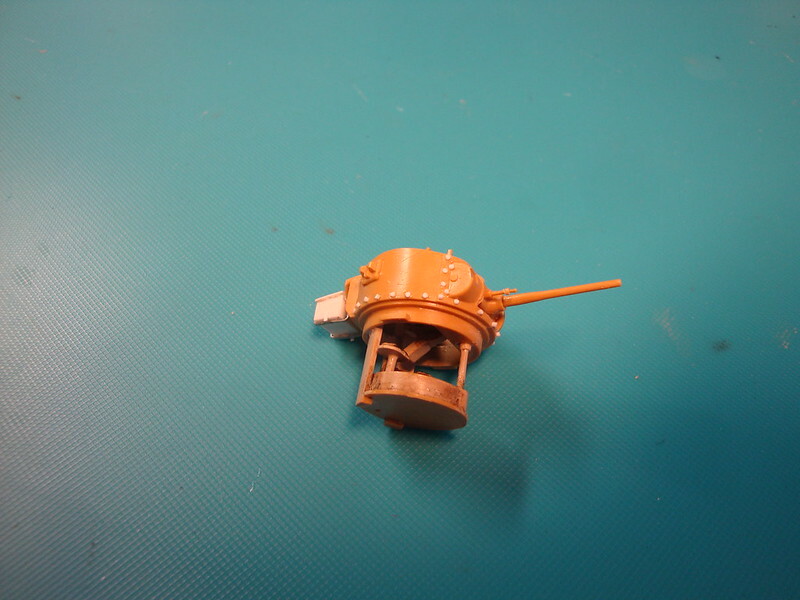 Antenna with pennants, made from thin copperwire, paper tissue and white glue. Antennas in place, towing cable in place, and finished! Final pictures, soon! Look old, used, worn out, dirty. And you are proud about that ? Shoud I send him to you ? Be warned if you put the Valentine into the Gallery! There is right now an ready to fire 88 Flak ! You can find all pictures in the Gallery.